The Northrop Grumman (formerly Ryan Aeronautical) RQ-4 Global Hawk (known as Tier II+ during development) is an Unmanned Aerial Vehicle (UAV) used by the United States Air Force and Navy as a surveillance aircraft. In role and operational design, the Global Hawk is similar to the Lockheed U-2, the venerable 1950s spy plane. It is a theater commander's asset to provide a broad overview and systematic target surveillance. For this purpose, the Global Hawk is able to provide high resolution Synthetic Aperture Radar (SAR)-that can penetrate cloud-cover and sandstorms- and Electro-Optical/Infrared (EO/IR) imagery at long range with long loiter times over target areas. It can survey as much as 40,000 square miles (100,000 square kilometers) of terrain a day. The Global Hawk costs about $35 million USD (actual per-aircraft costs; with development costs also included, the per-aircraft cost rises to $123.2 million USD each). The first seven aircraft were built under the Advanced Concept Technology Demonstration (ACTD) program, sponsored by DARPA, in order to evaluate the design and its capabilities. Due to world circumstances, the capabilities of the aircraft were in high demand, so the prototype aircraft were operated by the U.S. Air Force in the War in Afghanistan. In an unusual move, the aircraft entered initial low-rate production concurrently while still in engineering and manufacturing development. Nine production Block 10 aircraft (sometimes referred to as RQ-4A configuration) were produced, two of which were sold to the US Navy. Two more were sent to Iraq to support operations there. The final Block 10 aircraft was delivered on June 26, 2006. In order to increase the aircraft's capabilities, the airframe was redesigned, with the nose section and wings being stretched. The changes, with the designation RQ-4B Block 20, allow the aircraft to carry up to 3,000 pounds of internal payload. These changes were introduced with the first Block 20 aircraft, the 17th Global Hawk produced, which was rolled out in a ceremony on August 25, 2006. First flight of the Block 20 from the USAF Plant 42 in Palmdale, California to Edwards Air Force Base took place on March 1, 2007. Developmental testing of Block 20 took place in and 2008. Future Block 30 and 40 aircraft, similar in size to the Block 20, are scheduled for development from 2008 to 2010. Program development cost overruns had put the Global Hawk system at risk of cancellation. Per-unit costs in mid-2006 were 25% over baseline estimates, caused by both the need to correct design deficiencies as well as increase the system's capabilities. This caused some concerns about a possible congressional termination of the program if its national security benefits could not be justified. However, in June 2006, the Global Hawk program was restructured. Completion of an operational assessment report by the Air Force was delayed from August 2005 to November 2007 due to manufacturing and development delays. The operational assessment report was released in March 2007 and production of the 54 air vehicles planned has been extended by two years to 2015. 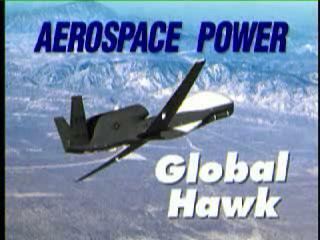 When the Global Hawk was produced it was in a sale plan for more than 5 countries including USA and Germany. The United States Navy took delivery of two of the Block 10 aircraft to be used to evaluate maritime surveillance capabilities, designated N-1 (BuNo 166509) and N-2 (BuNo 166510). The initial example was tested in a naval configuration at Edwards Air Force Base for several months, later ferrying to NAS Patuxent River on March 28, 2006 to begin the Global Hawk Maritime Demonstration (GHMD) program. Navy squadron VX-20 was tasked with operating the GHMD system. The GHMD aircraft flew in the Rim of the Pacific (RIMPAC) exercise for the first time in July, 2006. Although RIMPAC operations were in the vicinity of Hawaii, the aircraft was operated from Edwards, requiring flights of approximately 2,500 miles (4,000 km) each way to the operations area. Four flights were performed, resulting in over 24 hours of persistent maritime surveillance coordinated with USS Abraham Lincoln and USS Bonhomme Richard. As a part of the demonstration program, Global Hawk was tasked with maintenance of maritime situational awareness, contact tracking, and imagery support of various exercise operations. The imagery obtained by Global Hawk was transmitted to NAS Patuxent River for processing before being forwarded on to the fleet operations off Hawaii, thus exercising the global nature of this aircraft's operations. Northrop Grumman entered a version of the RQ-4B in the US Navy's Broad Area Maritime Surveillance (BAMS) UAV contract competition. On 22 April 2008 the announcement was made that the Northrop Grumman RQ-4N had won the bid, with the Navy awarding a contract worth $1.16 billion. In September 2010, the RQ-4N was officially designated the MQ-4C. The RQ-4 is powered by an Allison Rolls-Royce AE3007H turbofan engine with 7,050 lbf (3,200 kgf / 31.4 kN) thrust, and carries a payload of 2,000 pounds (900 kilograms). The main fuselage is standard aluminum, semi-monocoque construction, while the wings are made of lightweight, high-strength composite materials. The Global Hawk is the first UAV to be approved by the FAA to file its own flight plans and use civilian air corridors in the United States with no advance notice. This potentially paves the way for a revolution in unmanned flight, including that of remotely piloted cargo or passenger airliners. Picture - The Global Hawk's wings, fairings, nacelles, and tails are manufactured from high strength-to-weight ratio composites. The Global Hawk UAV system comprises an air vehicle segment consisting of air vehicles with sensor payloads, avionics, and data links; a ground segment consisting of a Launch and Recovery Element (LRE), and a Mission Control Element (MCE) with embedded ground communications equipment; a support element; and trained personnel. The Integrated Sensor Suite (ISS) is provided by Raytheon and consists of a synthetic aperture radar (SAR), electro-optical (EO), and infrared (IR) sensors. Either the EO or the IR sensors can operate simultaneously with the SAR. Each of the sensors provides wide area search imagery and a high-resolution spot mode. The SAR has a ground moving target indicator (GMTI) mode, which can provide a text message providing the moving target's position and velocity. Both SAR and EO/IR imagery are processed onboard the aircraft and transmitted to the MCE as individual frames. The MCE can mosaic these frames into images prior to further dissemination. Navigation is via inertial navigation with integrated Global Positioning System updates. Global Hawk is intended to operate autonomously and "untethered" using a satellite data link (either Ku or UHF) for sending sensor data from the aircraft to the MCE. The common data link can also be used for direct down link of imagery when the UAV is operating within line-of-sight of users with compatible ground stations. The ground segment consists of a Mission Control Element (MCE) and Launch and Recovery Element (LRE), provided by Raytheon. The MCE is used for mission planning, command and control, and image processing and dissemination; an LRE for controlling launch and recovery; and associated ground support equipment. (The LRE provides precision differential global positioning system corrections for navigational accuracy during takeoff and landings, while precision coded GPS supplemented with an inertial navigation system is used during mission execution.) By having separable elements in the ground segment, the MCE and the LRE can operate in geographically separate locations, and the MCE can be deployed with the supported command's primary exploitation site. Both ground segments are contained in military shelters with external antennas for line-of-sight and satellite communications with the air vehicles. The Global Hawk carries the "Hughes Integrated Surveillance & Reconnaissance (HISAR)" sensor system. HISAR is a lower-cost derivative of the ASARS-2 package that Hughes developed for the Lockheed U-2. HISAR is also fitted in the US Army's RC-7B Airborne Reconnaissance Low Multifunction (ARLM) manned surveillance aircraft, and is being sold on the international market. HISAR integrates a SAR-MTI system, along with an optical and an infrared imager. All three sensors are controlled and their outputs filtered by a common processor. The digital sensor data can be transmitted at up to 50 Mbit/s to a ground station in real time, either directly or through a communications satellite link. The wide-area MTI mode can detect moving targets within a radius of 62 miles (100 kilometers). The combined SAR-MTI strip mode provides 20 foot (6 meter) resolution over a swath 23 miles (37 kilometers) wide at ranges from 12.4 to 68 miles (20 to 110 kilometers). The SAR spot mode can provide 6 foot (1.8 meter) resolution over 3.8 square miles (10 square kilometers), as well as provide a sea-surveillance function. The visible and infrared imagers share the same gimballed sensor package, and use common optics, providing a telescopic close-up capability. It can be optionally fitted with an auxiliary SIGINT package. To improve survivability, the Global Hawk is fitted with a Raytheon developed AN/ALR-89 self-protection suite consisting of the AN/AVR-3 Laser Warning System, AN/APR-49 Radar Warning Receiver and a jamming system. An ALE-50 towed decoy also aids in the Global Hawk's deception of enemy air defenses. In July, 2006, the Air Force began testing segments of the improved Global Hawk Block 30 upgrades in the Benefield Anechoic Facility at Edwards AFB. This version incorporates an extremely sensitive SIGINT processor known as the Advanced Signals Intelligence Payload. In September 2006, testing began on a new specialty radar system, the Multi-Platform Radar Technology Insertion Program, or MP-RTIP, onboard the Scaled Composites Proteus. Once validated, one Global Hawk will be modified to carry this radar set. Previously, the Air Force was considering a larger variant of the MP-RTIP (known as the Wide-Area Surveillance or WAS sensor) for the cancelled E-10 MC2A testbed or E-8 Joint STARS aircraft. In August 2010, Northrop announced that a new version, block 40, was about to commence production; it would have a new sensor capabilities, including MP-RTIP radar, emphasising surveillance over reconnaissance. The Block 40 would also have modified undercarriage. Air Force Global Hawk flight test evaluations are performed by the 452nd Flight Test Squadron at Edwards AFB. Operational USAF aircraft are flown by the 9th Reconnaissance Wing, 12th Reconnaissance Squadron at Beale Air Force Base. Global Hawk ATCD prototypes have been used in the War in Afghanistan and in the Iraq War. Since April 2010, they fly the Northern Route, from Beale AFB over Canada to South-East Asia and back, reducing flight time and improving maintenance. While their data-collection capabilities have been praised, the program did lose three prototype aircraft, more than one quarter of the aircraft used in the wars, being lost. According to Australian press reports, the crashes were due to "technical failures or poor maintenance", with a failure rate per hour flown over 100 times higher than the F-16 fighters flown in the same wars. The manufacturer stated that it was unfair to compare the failure rates of a mature design to that of a prototype plane. Three Global Hawks have been lost in accidents. On February 11, 2010 the Global Hawks deployed in the Central Command AOR accrued 30,000 combat hours and 1,500 plus sorties. In December 2007, two Global Hawks were transferred from the U.S. Air Force to NASA's Dryden Flight Research Center at Edwards Air Force Base. Initial research activities beginning in the second quarter of 2009 will support NASA's high-altitude, long-duration Earth science missions. The three Global Hawks were the first,sixth and seventh aircraft built under the original DARPA Advanced Concept Technology Demonstration program, and were made available to NASA when the Air Force had no further need for them. Northrop Grumman is an operational partner with NASA and will use the aircraft to demonstrate new technologies and to develop new markets for the aircraft, including possible civilian uses. 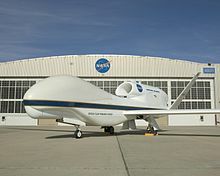 According to an article in the March 2010 issue of Scientific American (p. 25-27), the Global Hawk aircraft belonging to NASA were in use for testing purposes as of October 2009, with science missions expected to start in March 2010. Initial science applications included measurements of the ozone layer and cross-Pacific transport of air pollutants and aerosols. The author of the Scientific American piece speculates that the aircraft could be used for Antarctic exploration while based in and operated from Chile. In August and September 2010 one of the two Global Hawks was loaned for NASA's GRIP Mission (Genesis and Rapid Intensification Program), with its long-term on station capabilities and long range it was the best aircraft for the mission to monitor the development of Atlantic basin Hurricanes. It was modified to equip weather sensors including Ku-Band Radar, Lightning sensors and Dropsondes. It successfully flew into Hurricane Earl off the United States East Coast on September 2. 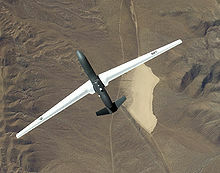 NATO has announced that it expects to have a fleet of up to eight Global Hawks by the year 2012. The aircraft are to be equipped with MP-RTIP radar systems. NATO has budgeted €1 billion for the project, and a letter of intent has been signed, although contracting with Northrop Grumman has not been finalized. The German Luftwaffe has ordered a variant of the RQ-4B equipped with European sensors, dubbed EuroHawk. It combines a normal RQ-4B airframe with an EADS reconnaissance payload. The aircraft is based on the Block 20/30/40 RQ-4B, but will be equipped with EADS' SIGINT package to fulfil Germany's desire to replace their aging Dassault-Breguet Atlantique electronic surveillance aircraft, which were taken out of service in June 2010. That sensor package comes in the form of six wing mounted pods, a first for the Global Hawk. The EuroHawk was officially rolled out on October 8, 2009 and first flight took place on June 29, 2010. It is slated to undergo several months of flight testing at Edwards Air Force Base before flying to Germany in May 2011. Initially the EuroHawk is to go to WTD61 at Ingolstadt Manching for testing. According to the original planning the first EuroHawk is to fly with AG51 in July 2011, but this will probably be delayed. The costs for the initial five aircraft are approx. €430 million for the development, and €430 million for the actual procurement. Australia had considered the purchase of a number of Global Hawk aircraft for maritime and land surveillance. The Global Hawk was to be assessed against the RQ-1 Mariner in trials in 2007. If selected the Global Hawk aircraft would have operated in conjunction with manned P-8A Poseidon aircraft by 10 and 11 Squadrons of the RAAF. This combination, or a similar one, would replace existing AP-3C Orion aircraft in 2018. With the current economic situation, and the delivery schedule pushed back to 2015; the Australian government had decided to cancel the order. Canada is also a potential customer, looking at the Global Hawk for maritime and land surveillance as either a replacement for its fleet of CP-140 Aurora patrol aircraft or to supplement manned patrols of remote Arctic and maritime environments. Spain has a similar requirement, and has existing contacts with Northrop Grumman. Japan has been reported as being interested in the purchase of three aircraft. However it might find it difficult to pay for them. South Korea's Defense Acquisition Program Administration (DAPA) had expressed interest in acquiring at least four RQ-4B and support equipment by 2011 to increase the intelligence capabilities of the South Korean military after the return of the Wartime Operational Control from the U.S. to ROK, and has allocated approximately USD$19m for evaluation purposes. There is ongoing debate among government officials on whether to take the US offer of Global Hawks or to press on with their domestic UAV development program. South Korea expects to sign a preliminary contract for the aircraft by the end of 2011. New Zealand's Defence Force is keeping a "watching brief" over Global Hawk, which has the range to conduct surveillance in the Southern Ocean around Antarctica, and in the Pacific Islands. At the moment the acquisition process has moved no further than an expression of interest. Also being looked at are the IAI Heron and a natively-developed hand-thrown drone, the "Kahu". The Indian Navy has expressed interest in MQ-4C Maritime Surveillance Unmanned Aircraft Systems. Initial production version for the USAF, 16 built. German Euro Hawk, based on RQ-4B. Equipped with an EADS reconnaissance payload in SIGINT role. For USN Broad Area Maritime Surveillance role; previously known as the RQ-4N. 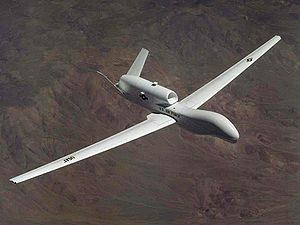 Scaled Composites and Northrop Grumman also offered a 50% proportional shrink of the RQ-4A, currently known as the Model 396, as part of the USAF Hunter-Killer program.